October 17, 2010 – Nick Kincaid, 23, of Tulsa Oklahoma, competed with 143 of the best weekend bass tournament anglers from the Oklahoma, Missouri, Texas East, Texas Southeast and Wisconsin/Minnesota divisions, taking 2nd place in the boater division despite a tough bite on DeGray Lake October 15-16, 2010. After bringing the largest single-day bag of 5 bass weighing 12.70 pounds in on day one of the event, putting himself in the lead, Nick was not able to catch a much-needed kicker fish on day two to keep him in the lead. He managed a 2nd place finish with a two day total weight of 14.87 just .07 out of the win. Nick added 2.17 pounds on day two with his one keeper bass. In all, he caught 25 bass during the two-day regional championship, but only six were keepers. 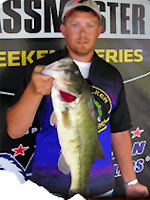 Nick Kincaid is a member of Drop Shot Dennys Bait & Tackle Pro Staff.